Ashwagandha is often touted as the Indian version of ginseng because, like ginseng, ashwagandha is revered as a non-specific tonic and adaptogen. 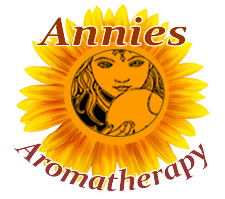 Adaptogens are important in cases of ongoing, chronic stress. Ashwagandha root rejuvenates without being over stimulating, so is more useful than ginseng in weakened and debilitated persons. Ashwagandha also relaxes blood vessels and stimulates circulation and has an anti-inflammatory and tonic effect in rheumatic and autoimmune conditions such as rheumatoid arthritis and lupus. Animal studies have found that naturally occurring steroids in ashwaganda are more potent than treatment with the synthetic steroid hydrocortisone for controlling inflammation.5 Ashwagandha is also used in the treatment of low back pain and sciatica. Preparation Methods & Dosage :. Ayurvedic Medicine Mildly warming. 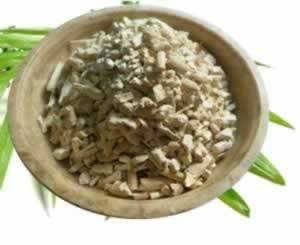 Ayurvedic physicians prescribe the root as an all purpose tonic, a grounding herb that stabilizes mood. 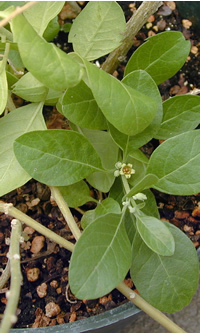 Ashwagandha Side Effects: Not recommended during pregnancy, except under the care of an experienced herbal practitioner. Distribution:India, Pakistan, and Sri Lanka. Hardy annual/Tender perennial. Scarifying seed will help in germination. Prefers rich,loose soil, moderate water, full sun. Collect leaves in the spring, fruit in the fall, and root after berries drop. Ashwaganda is a Hindi name meaning "horse's smell." The term refers not only to the smell of a horse, but also to a horse's strength. James Duke. "The Green Pharmacy Herbal Handbook" Rodale Books, (2000) Ashwagandha also seems to mimic gamma-amino-butytric acid (GABA), a naturally occuring substance in the brain whose role is to decrease the effect of stimuli that reach the brain. Karta Purkh Singh Khalsa & Michael Tierra. "Ayurvedic Herbs, The Way Of" Lotus Press, (2008) Ashwagandhas acts as a mild sedative, and as indicated by its botanical name somnifera, it promotes restful, deep sleep. Phyllis A. Balch. "Prescription for Herbal Healing" Avery, (2002) Animal studies have found that naturally occurring steroids in ashwaganda are more potent than treatment with the synthetic steroid hydrocortisone for controlling inflammation.